Nice Air is located in San Jose, CA, around 40 miles south of San Francisco in Northern California. The weather in California is perfect for flying almost year around. Form May to November, we have virtually no rain and the flying is very consistent. From November to May, we have great IFR flying weather mixed with several good VFR flying. You can train for all pilot licenses and rating all year long! Another advantage is our location. The San Francisco Bay Area is known throughout the world as an area with world class attractions, hotels, shopping, eating and easy day trips to such places as the Redwood National Forest, the Wine Country, Yosemite National Park and the beautiful ocean beaches. In the spring, we have excellent whale watching flights over the Monterey Bay. In the Winter, we have Skiing close by in the Sierra Nevada Mountains. Flying over California provides unbelievable scenery. You will be training in the valleys, mountains and over the ocean beaches of some of the most stunning scenes in the world. We are fortunate that we enjoy a moderate climate with low humidity and reasonable temperatures. California offers a mix of deserts, mountains, Valleys and ocean beaches and cliffs as your backdrop during flight training that can not be found anywhere else in the world. You can fly from desert to the high mountains of the Sierra to the Pacific Ocean all within one hour by aircraft! The Airport is a Class D airport with a control tower. The airport is open 24 hours a day and there are no restriction to use. There are two parallel runways, 31L and 31R that are approximately 3,500 feet long. There are NO landing or ATC fees of any kind. 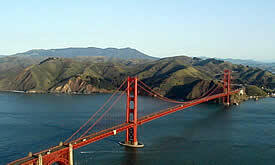 Reid Hillview Airport is 20 miles south of San Francisco International Airport.